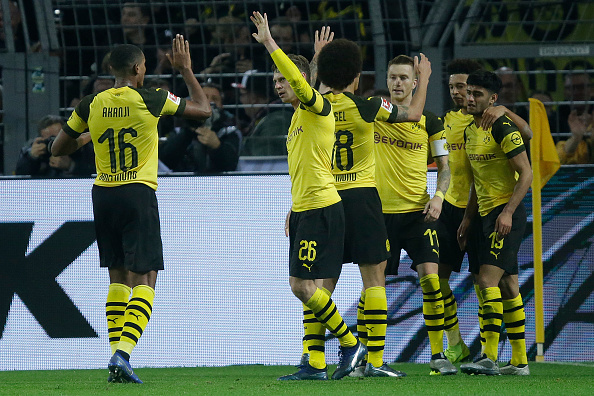 Borussia Dortmund twice came from behind to thrash defending champions Bayern Munich 3-2 and move seven points clear of their third-placed rivals. Bayern star striker Robert Lewandowski, who used to play for Dortmund, scored both of his team's goals, including the opener in 26 minutes. Then after Dortmund star Marco Reus scored the equalizer from a penalty in 49 minutes, Lewandowski gave his team the lead again just three minutes later with this goal. But then Dortmund caught fire. Reus scored again in the 67th minute on a lovely strike before the counter attack created the winning goal from super substitute Paco Alcacer in 73 minutes. Dortmund remain unbeaten and four points clear of second-placed Gladbach at the top of the table.